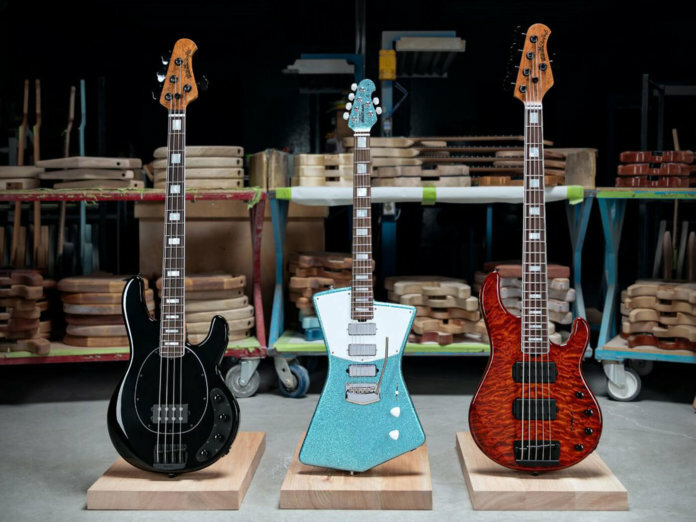 Ernie Ball Music Man has lifted the lid on April’s Ball Family Reserve models. The line-up for this month features a sparkle finish for St. Vincent’s triple humbucker model and custom appointments for a pair of StingRay basses. This edition of the Masseduction singer’s guitar features some aesthetic upgrades, including a custom Turquoise Crush sparkle finish, pearl block inlays and white pearl Schaller tuners. Otherwise, it doesn’t stray far from the regular St. Vincent signature model: African mahogany body, rosewood fingerboard, triple DiMarzio Mini humbucker and Music Man’s modern tremolo. Limited to 87 pieces. Retails at $2,899. This double-cutaway bass strikes a menacing front with a custom Hades Black finish and blackout hardware. Other highlights of this limited-edition model include pearloid block inlays, a figured roasted maple neck and a rosewood fretboard with hand-fitted white binding. Elements that have been retained from the regular StingRay Special 4 H include an ash body, a single Music Man bridge humbucker with neodymium magnets, and master volume and three-band EQ controls. Limited to 81 pieces. Retails at $2,799. This five-string bass stands out with its arresting 5A quilt maple top that’s been hand-stained with a translucent Giants orange finish. Like the model above, it has a figured roasted maple neck, a rosewood fretboard and hand-fitted white binding, but features pearl block inlays instead. Its black Schaller Music Man tuning pegs provide a nice visual contrast. And there are no surprises where electronics are concerned: two beefy humbuckers work with a three-band EQ, five-way pickup selector and master volume knob for fat, punchy tones. Limited to 91 pieces. Retails at $3,499.